The 24th annual Becel Ride for Heart will close both the Gardiner Expressway and the Don Valley Parkway as approximately 13,000 bikers will be taking to the pavement. The closures will be from 2 am to 2pm Sunday with the Gardiner shut down from Carlaw Avenue to the Humber Bridge and the DVP from Highway 401 to the Gardiner Expressway. And for those looking for alternative routes, the number one suggestion is to use public transit or take other routes such as Lake Shore Boulevard, Yonge Street, Bayview Avenue, Leslie Street or Don Mills Road for Sunday travel. Last year, 13,000 people participated in one of three separate events involving routes of 25k, 50h, and 75k. This year’s expectation is to see the event raise $3.9 million for scientific research into heart disease and stroke. Cyclists have a rare opportunity to see the city in a different way by peddling on some major highways while passing the Toronto skyline up close and personal. On June 5, 2011, gear up for an exhilarating opportunity — riding to give Canadians longer lives — in the 24th annual Becel Heart&Stroke Ride for Heart. The Ride for Heart is a charity bicycle ride organized by the Heart and Stroke Foundation of Ontario and sponsored by Becel brand margarine. The Ride takes place, on Toronto’s Don Valley Parkway (DVP) and Gardiner Expressway, major 6-lane highways leading into the downtown core on the eastern and southern side of the city. 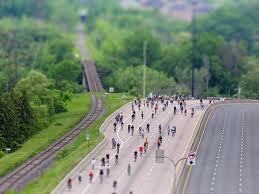 On the first Sunday of every June, the DVP and Gardiner are closed and turned over to the Ride in the morning. Three routes are planned out, at 25, 50 and 75 km, and shorter rollerblading events have been added as well. The first Ride took place on this route in 1987, and has grown immensely since then. 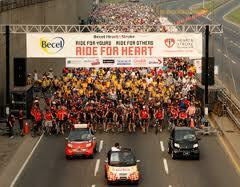 The latest Ride, on June 7th 2009, attracted over 13,000 riders and raised $3 million in funds. While both roads are infamous for traffic jams during normal rush hour, the mass of riders creates problems of a far larger scale, and has led to staged starts and other efforts to improve traffic flow. Generally, those riders wishing to complete the 75 km course or are parts of a corporate team are started as early as 6:45 AM, with other riders following over the next two hours. A bike ride is just a bike ride until it’s Ride for Heart. This incredible event has been hosted by the Heart and Stroke Foundation for 24 years, raising crucial funds for world-class research that helps Canadians live longer, better lives. While Mayor Rob Ford and Public Works chairman Denzil Minnan-Wong made political hay with the closure of the Gardiner Expressway and Don Valley Parkway for the Ride for Heart in the past, they’re toning down their criticism now that they’re at the city’s helm. … As a councillor, Ford raged against the closure along with Minnan-Wong, even posing for a photo over the Don Valley Parkway to protest the shutdown. What a difference an election makes. Did The Jacksons Ever Have A Sense Of Humor? What Does Gaming Look Like in 2018?